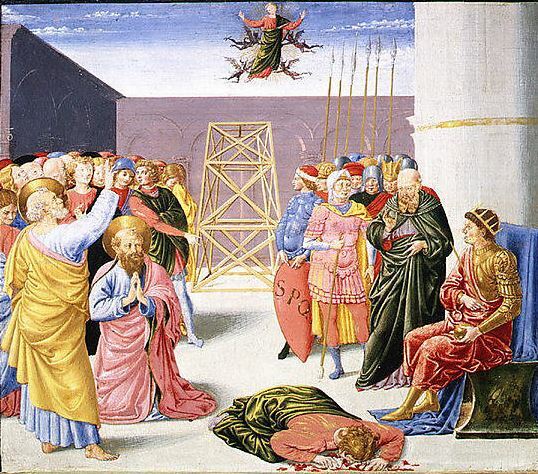 The church tradition of Simon Magus crashing to the ground at the feet of Emperor Nero when the Apostle Peter commanded the demons who suspended him in midair to let him go is depicted in an artwork commissioned in the 1460s by the Alessandri family in Florence, and which is now exhibited in the Metropolitan Museum of Art. Simon Magus is considered to be the first Christian heretic, the first Gnostic, and the founder of the sect of the Simonians. Had he been diligent in getting rid of his bitterness and other sins, it seems certain that history would have painted him in a different light.